There is no better way of getting to know an area than through the soles of your feet. Here is a resort that boasts dramatic coastal climbs rich in flora and fauna (including various rare and endangered species) and stunning architecture of days gone by. Perched on a series of seven hills, there are plenty of opportunities for catching a good view from whichever direction you look! There are a host of hidden treats waiting to be discovered by the inquisitive and those wanting to escape the hustle and bustle of the 21st century. 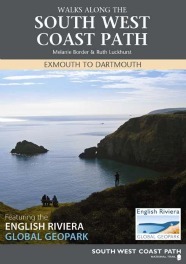 Walk the entire 22 miles of the English Riviera coastal path and discover a unique landscape. The route extends from Maidencombe beach in the north to Sharkham Point, following the arc of Tor Bay. With an interesting mixture of cliff top and beachside walking, this stretch forms part of the South West Coast Path, the largest and most-loved public right of way in Britain! Walking on the English Riviera is as much about our cultural heritage as our natural environment. Imagine, for example, the style and opulence of the 1920s as you walk the Agatha Christie Mile along Torquay's seafront, passing landmarks that influenced the author's life and works. Pick up a leaflet from one of our three Tourist Information Centres. Watch out for our walks book "Walks along the South West Coast Path, Exmouth to Dartmouth, Featuring the English Riviera Global Geopark" which will help you explore and enjoy the Geoparks spectacular coastline and the beautiful rolling hills that surrounds it. Available from the Geopark Visitor Centres, Tourist Information Centres and online.